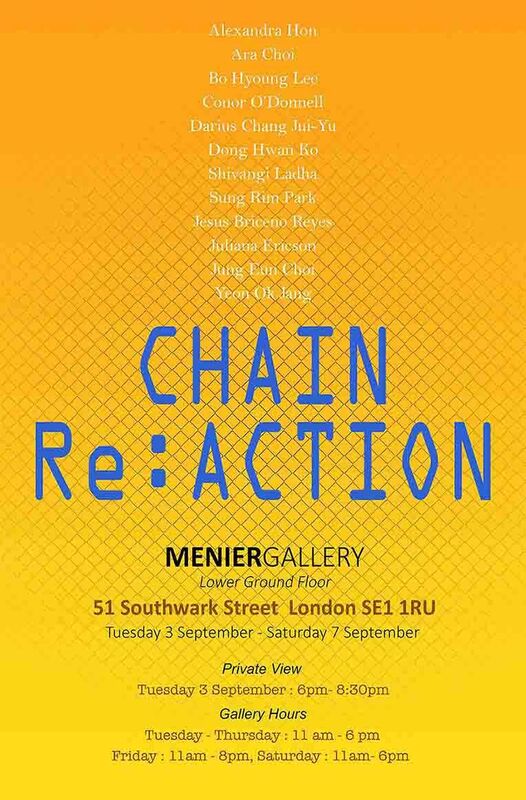 Chain Reaction is a remarkable collaboration show by artists from CSM, Chelsea, Goldsmiths and Wimbledon. It began with one artist from each college connecting with other artists though friends and colleagues creating a chain. Chain Reactions can be thought of like a wave motion or effect, which in this case is the positive influence collaboration, can have on art allowing ideas and inspiration to move through the group. However, for a Chain Reaction to occur there need to be a catalyst. This show aims to be the catalyst for a larger reaction, improvement in art. The initial reaction also creates a level of synergy among the members allowing the exploration of ideas of desire, expectation and other ongoing research subjects. There are explored through prism of the artists' personal experience, observation and artistic discourse. This collaboration facilitates the sharing of the artists' academic and artistic experience and knowledge. 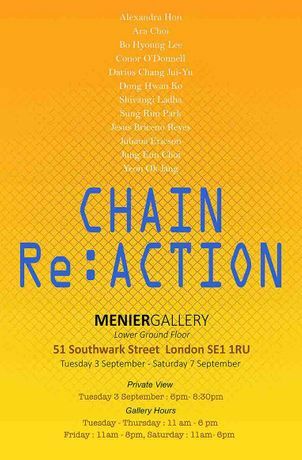 Featuring artists Alexandra Hon, Ara choi, Bo Hyoung Lee, Conor O'Donnell, Darius Chang Jui-Yu, Dong Hwan Ko, Shivangi Ladha, Sung Rim Park, Jesus Briceno Reyes, Juliana Ericson, Jung Eun Choi and Yeon Ok Jang.